I've been wanting a poncho for quite a while so I was thrilled to have found this one on Sammydress last month. The soft white color goes with literally everything and the coziness factor cannot be beaten! If you are worried about a poncho swallowing your figure whole, go for a slightly fitted one like this. Its still got a relaxed fit, but doesn't overwhelm with its size (For reference I am wearing a size medium.). Try pairing your poncho with skinny jeans and riding boots, too. A more fitted pant will to help balance out all the fabric on top. Even though I am all about the poncho, today these boots are making me feel confident. I bought them (a big splurge at the time) when I was a college student in London. Boots were starting to be big way back then and I hated all the cheap pairs I saw. I got these ones in a little shop in Greenwich and I have to pat my younger self on the back. Riding boots are still quite popular and these have seen many miles and continue to look darn good. If that doesn't make you feel good about your outfit, what does?! Alecz from forsevenseasons is co-hosting today. I've been following her blog for a while. She has some fabulous work-wear inspiration. Alecz does a wonderful job of creating fun work looks by adding color, texture, and amazing jewelry! Make sure you stop by and tell her hello! Smart purchase younger you! The boots are timeless and work with so much. Love the poncho. Your poncho looks so cosy and I love the striped tee layered underneath it! :) I think leather boots are always a great investement - with a lot of care they can easily last for years. My mum's favourite pair she's had resoled countless times and are over 10 years old and still look great! Love this white poncho, such a cute casual winter look! Love this poncho and your striped tee underneath! I do love the fit of this poncho as well. It's so flattering! Love the winter white poncho! Such a cute layered look! Adorable cozy look and love the boot socks! Thanks for hosting, Beautiful! The boot socks make your outfit/tie everything together. love it! I really need to get some boot socks, my regular thicker ones always slide down while I'm wearing my boots. 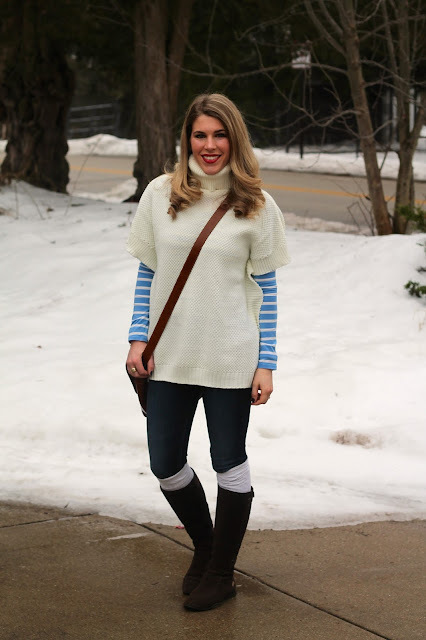 I really love the blue in this outfit against the white- perfect winter colors! Love how that poncho fits you like a glove and the striped top is the icing to the cake - Have a great week! 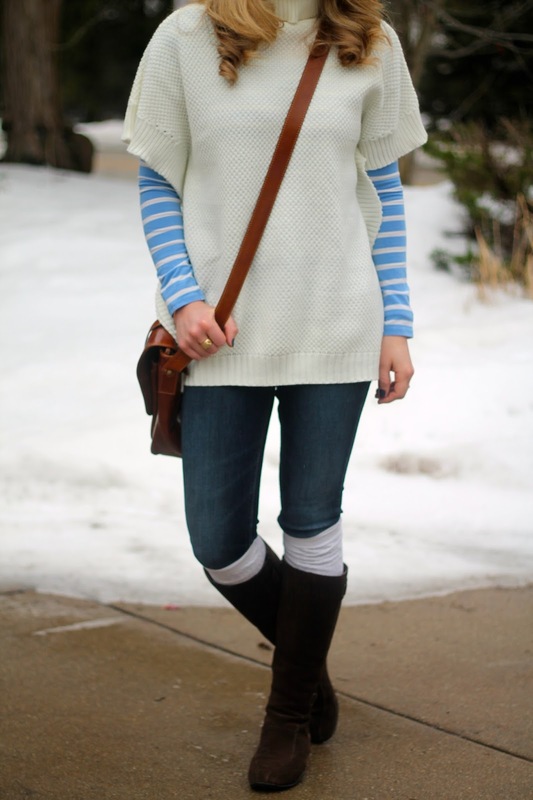 Very cute style, love the poncho over the blue and white stripes. You look cozy and chic! Great poncho! And I love smart purchases. It really pays off to invest in good-quality, classic pieces. Love the striped shirt under the poncho! Such a cute outfit Love the poncho!looks so cozy and warm~! You look great!!! I love your poncho (especially layered with stripes!) and the boots are great. You can't beat a good pair of riding boots--I have a pair that I wear ALL the time. They were a bit of a splurge at the time too, but I'm so thankful I got them. Good shoes are worth it! i never would have picked out a poncho, but i LOVEEE this one!! you look great. I love this poncho!! And, I love how you paired it with the cute stripe top. Looks so cute and comfy! 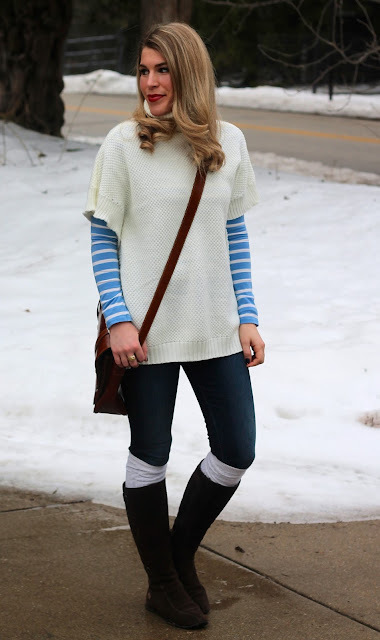 I love the blue and white striped tee you paired underneath! And your hair looks so fab in this post! I love the mix of textures and layers in this look. The poncho is the perfect length too! How fun is that poncho?! It totally fits you to a t.
Love the layering. Those boots are gorgeous!! Ekkk! You look so cute AND warm! Such a pretty look! I love the powder blue strip under the poncho! Beautiful! Love the story of your boots! Gorgeous tunic, I love how you layered it. 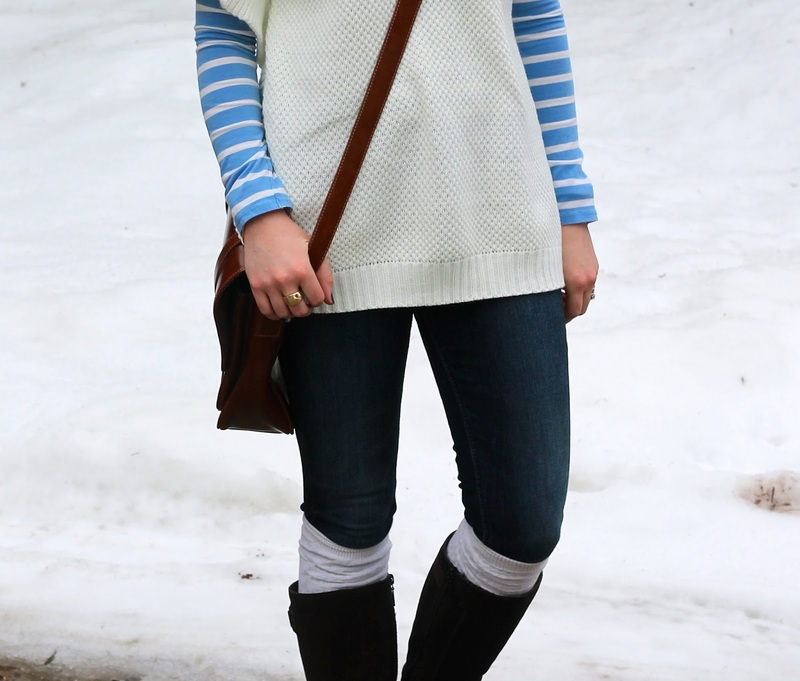 Great layering, love the blue stripes! I love the striped top under the poncho sweater! Great find! This style of poncho is my favorite. 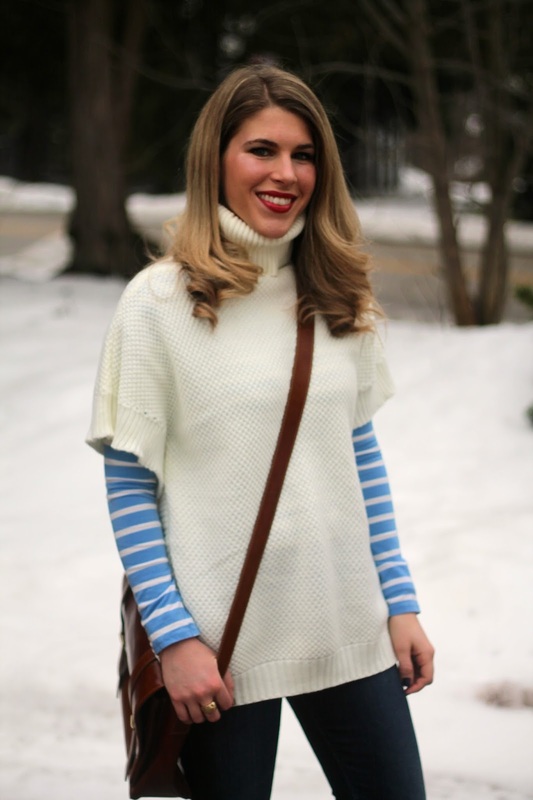 I love how the blue stripes pop against the cream poncho! Thanks for allowing me to co-host Laura! You look so warm and cozy! I love it! Oh! I love this look! The light creamy color is perfect for layering anything underneath. I don't always like bulky sweaters and end up pushing up the sleeves 3/4 so these shorter sleeves are perfect in my book! Breat layered look! Love the blue stripes peeking out of the neutral poncho. Love the poncho and the boots! You are so lucky you got to spend time in London, and I can't imagine a better souvenir than those gorgeous boots! It is good sometimes to splurge when it comes to quality fashion. I think your self made a great invest on those riding boots! I also loved how you layered your poncho! I really love this look on you and as a whole. So perfect for this time of year and not drab or dreary at all. 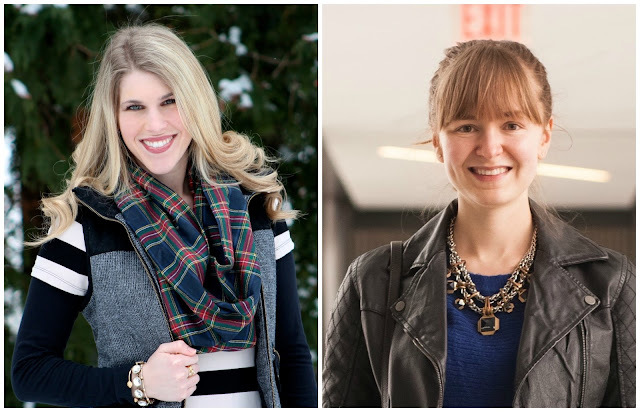 Thanks for linking up at Whatcha Wearing Wednesday too! Love love love this, it's so casual chic! Thanks for linking up with me and this will be getting pinned to the linkup board! Such a cute layered look! I love adding knee high socks to my boots as well!